I love Asian grocers, I particularly love the cheapness. It makes me chuckle every time I see a tiny 25g sachet of coriander leaf in Waitrose for 89p. A two minute drive down the road and for the same price I can get two whole bunches of the stuff. More coriander than I know what to do with (might be an exaggeration). Garlic, ginger, chillies, spices, fresh fruit and veg. I can stuff a carrier bag full and never have to break a bank note. Anyone serious about cooking living in a big city knows their nearest Asian grocer. Springfield (Sparkhill) Parade on Stratford Rd is close to where I live, on it there are 5 big grocers all vying for business. It’s a perfect competition scenario as studied in Economics class. Stock is turned over quickly and always fresh. But A K Superstore is not there. It’s on the Coventry Rd in Small Heath. The bit you never go down because that’s why the Small Heath Bypass was built. That stretch of the Cov road is teeming with Asian and Middle-eastern businesses. 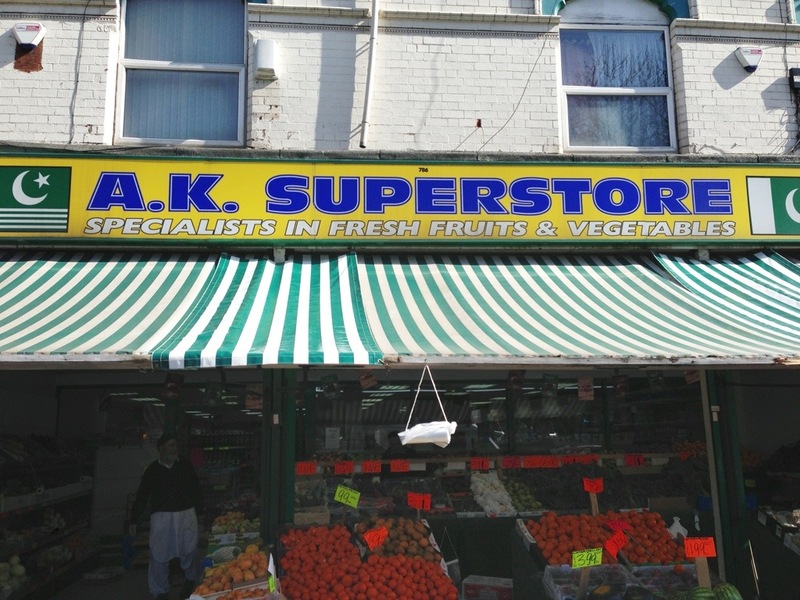 AK Superstore is opposite the park and has the freshest fruit and veg of all the Asian grocers I’ve ever been in. Whenever I go there is always someone checking over the produce and discarding any that aren’t pristine. Worth a detour if you’re in the area especially during mango season. I’ve been to many Asian supermarkets for my fruit and veg but I must say this supermarket has the most freshest fruit and veg I’ve seen in Asian supermarkets with very good prices and the supermarket is also kept very clean and tidy and wel presented and not to forget the staff are also ver polite and helpful. I’ve become a regular customer and don’t use no other supermarket for my grocerys any more. Next Next post: Razor clams. Musings and some recipes.